Dreaming specifically rather than broadly is an important component in bringing dreams into the realm of reality—when they’re specific, it’s much easier to take conscious steps to move closer to those goals. So, when you’re chasing a specific goal and run into a roadblock (a brick wall), you will be that much more determined to try to climb over it, treating that obstacle as an opportunity to show how badly you want to get in. Also, you will not feel that you are entitled to be on the other side of that wall—hopefully, with specific dreams, the dreamer, like Randy, will feel they have to earn their way over the wall and will then be capable of doing so and grateful once it happens. Randy doesn’t just call NASA and beg them to let him go on the zero gravity plane—he finds a way to make himself qualified so he can “bring something to the table,” thus earning his way on board. Randy certainly uses this obstacle as an opportunity to show how badly he wants to float in zero gravity, and he is rewarded with the floating he’s desired since man first walked on the moon. Randy’s positive, realistic but proactive attitude also certainly played a big part in his ability to actualize his dream. Koltun, Moe. "The Last Lecture Chapter 6: Getting to Zero G." LitCharts. 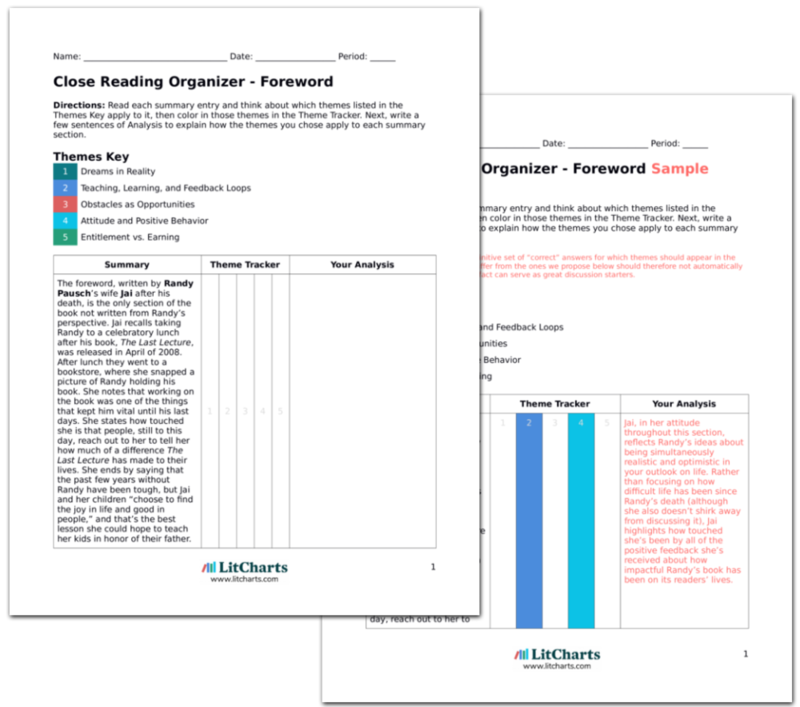 LitCharts LLC, 26 Feb 2017. Web. 23 Apr 2019. Koltun, Moe. 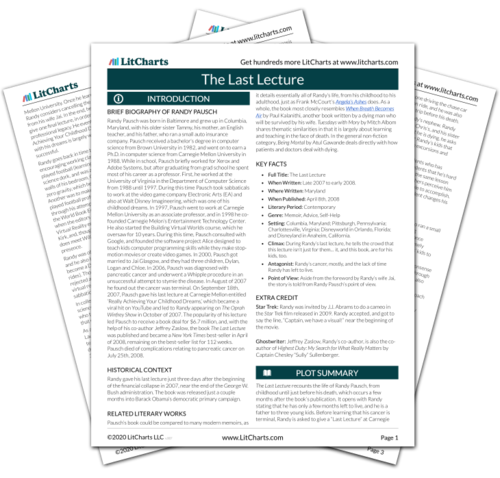 "The Last Lecture Chapter 6: Getting to Zero G." LitCharts LLC, February 26, 2017. Retrieved April 23, 2019. https://www.litcharts.com/lit/the-last-lecture/chapter-6-getting-to-zero-g.